Some instructors ask their students to write or edit articles on Wikipedia. See, e.g., Jon Beasley-Murray’s article on “Murder, Madness and Mayhem,” detailing what students in a Latin American Studies course at UBC did on Wikipedia. Students in a Psychology course may be able to actually conduct a research project (rather than just planning one) and present their findings at a conference or in a publication of some kind. Students in a History course may produce historical research about their local area with primary sources, that is then useful to community groups outside the university. Students in Physics 101 at UBC, taught by Simon Bates, create learning objects (such as videos, power point slides, and diagrams) to help teach physics concepts to others. Graduate students in a course on open education (taught by David Wiley) put together an Open Education Reader, a collection of readings on open education, with commentary. They released it as a free, open, online book that anyone with access to the internet can use. Long-time readers here will know that renewable assignments are close to my heart, They were the basis of my first educational technology work, the topic of some of my first edublog posts, and it was issues with renewable assignments that led me to spend the last year and a half learning the secrets of federated wiki zen. Small class sites (such as wikis) have a hard time bootstrapping to something useful, and even when they do get there they start to rot right after finals. Large collaborative sites like Wikipedia make student work durable and provide a scaffold to build on, but require that the needs of the class bend to the needs of the site. So on one side we have control, but the work you do has to start from scratch and begins to decay after finals. And on the other side we have, well, Wikipedia. And I love the re-focus recently on writing Wikipedia articles as class assignments, but anyone who has worked in that space understands how much of your class must become about Wikipedia to do this. Additionally issues like notability adversely affect your class’s ability to cover niche issues, minority viewpoints, or items of only local significance. But what if there was a way (I know I sound like an infomercial here) — what if there was a way for classes to build on the work of others while maintaining control of the direction and focus of their class? And what if instead of the work decaying at the end of the semester the work propagated and proliferated to other classrooms that could carry it forward? Classrooms that would keep it alive, and updated, and living? Let me outline a vision for you. You are teaching an economics class and looking to create a renewable assignment. You browse things in a massive library of student work called the Federated Library and you find this interesting article, written by a student in a sociology class. The article describes the effects of this weird market economy for rat tails in turn-of-20th-century Hanoi. A “rat bounty” for rat tails (designed to decrease the rat population) perversely led some enterprising locals to breed rats for their tails, and others to chop off rat tails while letting them live, all of which increased the rat population there. There’s an economic model here that the students can build in Excel. 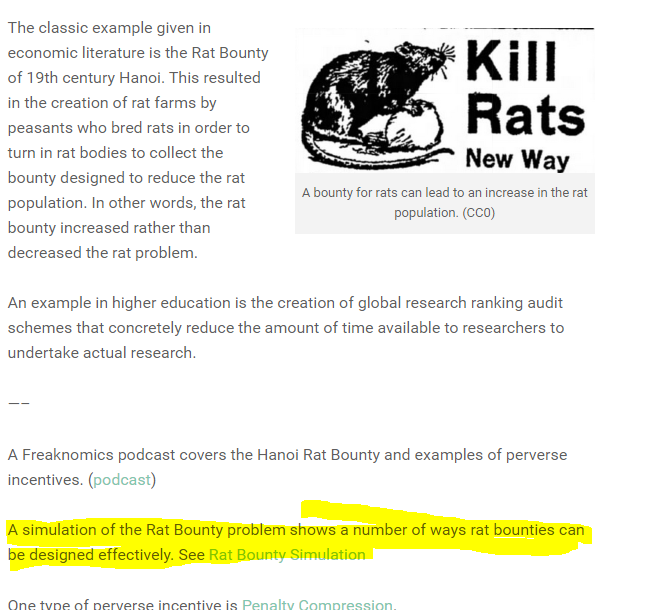 Your class can set a “rat bounty”, a cost of breeding rats, the opportunity cost of breeding rats, the cost of catching rats, and see how playing with these variables changes rat production in Hanoi. What we want to do is get more insight into what this story is telling us. Along the way we learn the math of economics. So here’s how you begin — you copy this page and a number of others into your class site. These are now the background to the assignment that the students have to read. You search the federation and find a decent explanation of how to create supply and demand models in Excel. You fork that in too. They work through that question and produce an Excel spreadsheet that models the situation as well as a number of pages summarizing their findings and research. And when they have that stuff together they post it up to the class site and link it to the materials you copied in from the sociology class. You’ve essentially used the sociology materials to bootstrap your economics site. The story continues. A history professor browsing the federated library comes across this while thinking about local history. And she thinks — well, this is a weird story, because didn’t Portland also have a rat bounty at the turn of the century? And nothing like this happened, at least to her knowledge. So she adds a segment in her digital humanities inflected course where the students will research and write a history of public health issues in turn of the century Portland. 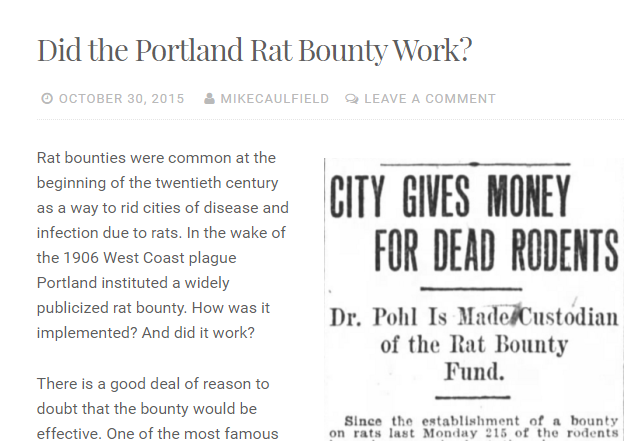 One of the pages her class creates is called Did the Portland Rat Bounty Work? And it links at the bottom to the copied material from both the sociology class site and the economics class. It also notes that the Hanoi rat bounty story seems to be derived from one administrative report written three decades after the event in French, and asks whether there is maybe a French class that could translate? Following a convention of the federation the page is tagged #french-translation-needed to make it easy for language teachers to find the assignment. You see what has happened here? 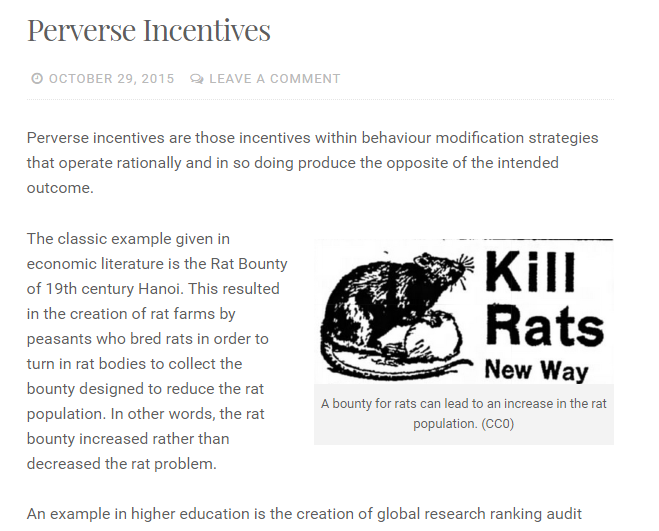 That sociology page about Perverse Incentives is on three individual sites now. Four, maybe, if it gets picked up by the french class. And as it moves through the network and proliferates it stays updated, and gets extended rather than dying a slow death on an abandoned class wiki. If the class wiki ever dies, the page survives. More importantly, classes do important work by building off the work of students before them, And they do it all without ever having to coordinate with another class, or ask permission to post stuff on a wiki that someone else owns. They do this all in their own space, and allow the architecture of federation to make it possible. I can’t compress the rationale for the architecture into this sort of space. Part of me just wants to say that look, I’ve walked through every nook-and-cranny of this problem over the past two years and federation is the only way this can work. Most of me knows that isn’t a good enough explanation. But this workflow up above, where class builds on top of other class in a permissionless, fluid way? That’s the dream. That’s why a federated read/write architecture is worth it. That’s why it matters. I’m working on this WordPress implementation of federation now, largely because Jim Groom is like the Bill Gates of edtech and #ReclaimSoft is populating the education landscape with thousands of WordPress servers. So I want those servers to be pointing at this mission. But this thing above? This dream of the fluid class-by-class extension of our collective knowledge and understanding? That’s why it’s worth it. That’s why it’s worth building right. That’s what makes federation as a model worth the effort to understand. And that’s why so many other initiatives right now just seem unexciting by comparison. Edit: What I describe here is not meant to imply you should write on the web one way or another. Different styles serve different purposes. But I think sometimes people are confused as to why we need wiki, or OER, or other such things when we “have the web”. And the answer is that the conversational part of the web is often hostile to noobs…. Picking up on Josh’s “quick think” on notions of an activism of symbols, a couple of things come to mind (imagine that, right? Me on a tangent!). First of all, as Jane mentioned, all things are not equal: sometimes words really do hurt. More importantly, the gun divide in our country makes action impossible, This leads to something similar to the Commodity Activism that I’ve mentioned here before. When you can’t take action on an issue, you crave ways to signal concern. Why wouldn’t you? How’d that make you feel reading that? Did you feel invited in? Or did you feel left out? Who is “Josh”? Who’s “Jane”? Why is the phrase “quick think” linked and quoted? Is that an inside joke I don’t know about? Who is this “me” and why is it funny they are on a tangent? Is this “things are not equal” post important? What’s not equal? Am I supposed to have read these previous posts first? If you blog, you probably think that your posts don’t read like this. And they probably don’t to your friends. But to strangers they feel like this. And to students the papers and posts you assign may feel like this as well. Posts like this build a community, and use links and references to other conversations to strengthen that community. It feels good to people in the community. But it comes at a price. Write for the Federated Library Project! Or maybe it’s the Federated Learning Project? We’re going to try to construct some federated wiki-ish stuff in WordPress. I explained what I need to do to get WordPress to act in the way we want it to to Boone Gorges, and he said it would be relatively easy, which means it should take me about three months. But in the meantime I need people who can do “wiki on WordPress” so that we can have some content to work with as we explore federated WordPress. Get a WordPress.com account or install WordPress yourself. Set up a new blog. It must NOT be in a subdirectory. An example of a WordPress install that works is here. To get an available name on WordPress.com I just added “flp” to my other blog URL, but you can name it what you want. Write for reuse in this space. What you post should be easy for others to reuse on their site with modifications. So no posts trying to prove a personal point or narratives that wouldn’t make sense out of someone else’s mouth. You are contributing words to your wiki that someone else can use with minimal modification. Note that I just wrote up these sample pages this weekend, so they aren’t linky yet. But they will be. A core tool of the Federated Library Project is reader-based associative linking. We want you, over time, to make sure your pages are linked to things people reading those pages are likely to find useful. So first note: when you original post, there may not be anything to link to. But keep your eye out for new pages or ideas you can link to it and come back. Second note: Copy other people’s posts to your site and link to those local copies too. More on how to do that in a few days. Third and very important note: Create links in the format “\a-trifle-bitchy” where “a trifle bitchy” is the slug of your page. This last point is important because as we build tools for federation it is important that links are portable from one site to the next, and links which include either the domain name or the folder structure will not be portable. So think before you link. You can see an example of a correctly formatted link on Town Equals 4,663. Because we’re all working together to make one big happy resource, a style guide helps. Here’s quick guidance. Pages can be organized around ideas, facts, data, theories, perspectives. But always be thinking about reuse: how could you write this in such a way it could be linked from multiple other pages? The title should be short — it is a name for the idea, not the title of a journal article. The first text paragraph of the page is a synopsis. It should summarize the content that follows. Don’t get too clever here. A person should be able to read the synopsis and understand what the page is about. The synopsis will be heavily used to help steer readers to information they need, so make it count. The “expansion” follows the synopsis and delivers on the promise of the synopsis. Page annotations and citations follow the expansion down at the bottom. These are links to supporting external citations and wiki links to other pages that might be of interest to the reader of this page. We have a convention of separating annotations and citations from the main page with five dashes (“—–” and a carriage return, the way you would do old school footnotes. See Town Equals 4,663 for an example. I want to get some people doing wiki on WordPress, building up the culture while we come up with the tools that connect these individual wikis into one big federation. If you want to experiment with me you just need a spare WordPress blog and a few minutes a day. Let me know. My Daughter Made a Cute Piece of OER on Art History. Discuss. My wife Nicole was trying to make a short video for her fifth grade art class, but found it hard to get up the requisite on-camera energy for that sort of thing. So my 12 year-old daughter stepped in as pinch hitter and delivered the lesson. I think she did pretty good, and if you don’t agree you are wrong! I was watching Jesse Stommel at NWeLearn this past week give an excellent presentation on grading. In it he suggested a number of alternatives to traditional grading, and outlined some of the ways that traditional grading is baked into the system. I outlined my vision of a different approach to networked learning last week to a number of people at dLRN, and the response was overwhelmingly positive. But the negatives were very negative. I looked over my presentation to try to find the spot where we reached the Age of Aquarius via some Node server installs. I saw a lot of places where I said we could be doing much better, but couldn’t find the places where we cured all ills. I was watching someone give a presentation on the struggles of the non-traditional student. After the presentation people were talking. I’m worried about the binaries here, they said. Why do we talk about non-traditional vs. traditional? Why can’t we just talk about STUDENTS? That’s a great comment. I actually can’t get it out of my head it’s so good. You know what’s not a great comment? These aren’t really useful questions, and I’ve come to realize they aren’t meant to be. The issue with Jesse’s call to action and mine is the same — we’re both arguing for things which are so far out of the mainstream of practice you have to squint to see them. This approach suffers the same affliction, assuming that we must compare a proposed solution against the standard of an imagined perfect world rather than a screwed up current state. I’ve come to realize that, no matter how many caveats you add to your writing, people for whom the status quo works will always reply that your ideas are interesting, but why are they so binary, so utopian? I used to take these critiques seriously, but I don’t anymore. It’s simply a rhetorical move to avoid comparing your solution with a status quo that is difficult for them to defend. There’s as little chance that the world is going to go overboard on Jesse’s Peter Elbow inspired grading models as there is that we’re going to veer too much toward addressing global warming or decreasing U. S. Military funding (appx. $2,000 per capita) relative to our foreign aid (about $70 per capita). There’s as little chance that our “Pull to Refresh” obsessed culture is going to go overboard with wiki as there is that solar-powered vehicles will result in a war against gas-powered cars. People who make such objections are not serious people, or in any not case serious thinkers in that moment. The reason we make binaries in our comparisons is to show how unbalanced the status quo is. The “binary” of pitting military spending against foreign aid is to show how out of balance out priorities are, just as the “binary” of Jesse’s holistic grading against more rigid models is to show how little time we spend on the whole student. And the reason we posit the binary of the “nontraditional student” against the “traditional student” is that 90% of policy and conversation right now is directed at the latter, and separating these details can show this. The Garden approach I outlined at dLRN might not work, and holistic grading might fail at the scale people need to use it at. That solar car may run up against physical and environmental realities that make it unfeasible. Our policies to help the nontraditional student may solve the wrong issues, or assume a political climate we don’t have right now. Foreign aid may be better directed at world hunger or medical research, or perhaps there are good reasons for spending $800 billion on a military. Perhaps, far from making things better, a set of proposals would make things worse in ways the historically literate can predict. All these are interesting points, and great follow-ups to presentations outlining potential courses of action. Additionally, some binaries are ill-formed, and give a distorted picture of reality. That’s an interesting point as well. Is androgogy/pedagogy a more helpful lens on a particular issue than first-generation/nth-generation? Does the research support a division like “Digital Natives/Digital Immigrants”? (hint: it doesn’t). These are great questions too. “Why so utopian?” and “Why so binary?” Not so much. Here’s my pitch to you, and it is always the same. I think we can do substantially better than we do now, in a way that benefits most people. I think it requires rethinking some assumptions about how we teach and how we tech. I think the positive impact is likely relative to how deep we’re willing to go in questioning current assumptions. So, if you like the status quo, or think it’s better than what is proposed, then defend it! If you think my ideas will not be adopted or will make things worse, then show me why! But to the Utopian Binary comment crowd: Stop pretending people like Jesse and I are making utopian, either/or arguments. It’s a lazy rhetorical move, I’m tired of it, and you’re taking time from people with real questions. 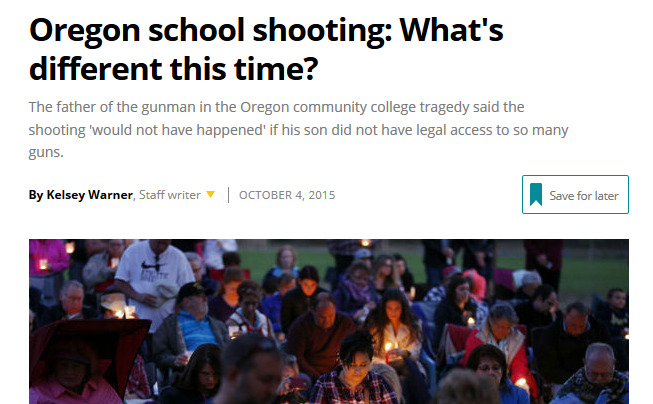 A week or so ago, I was reading about the Oregon shooting. I’m a pretty standard issue liberal and when I see things that support my liberal views I tend to notice them. 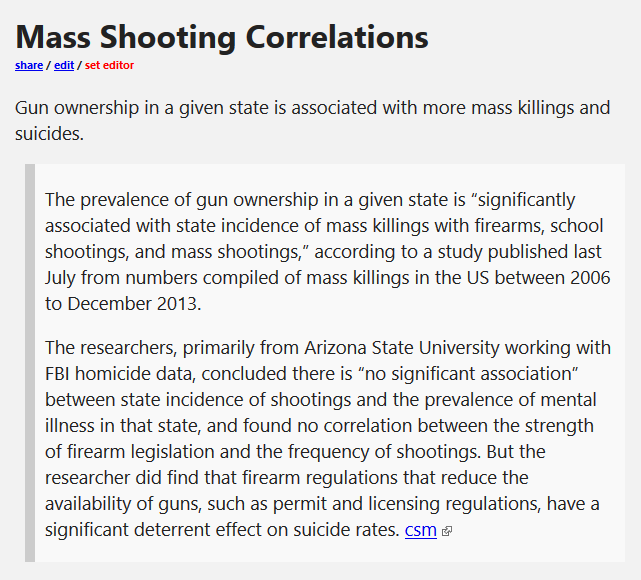 The prevalence of gun ownership in a given state is “significantly associated with state incidence of mass killings with firearms, school shootings, and mass shootings,” according to a study published last July from numbers compiled of mass killings in the US between 2006 to December 2013. So the blood starts pumping. Dammit, I’m right. When will the world see it? So a year ago I would have thrown the link to Twitter with a damning summary of the study, and everyone would have known I was a good liberal and retweeted it to prove that they were good liberals and if you listened closely you could hear our collective neurons harden. But for the past year I’ve been experimenting with another form of social media called federated wiki. And it’s radically changed how I think about online communication and collaboration. So when I see an article like this I think — Wow, I don’t have much in my wiki about gun control, this seems like a good start to build it out and I make a page. This is the most basic page I can imagine — it’s pretty close to a tweet, and it took about as much time. I looked through the revision history and it took me about 45 seconds to make this much of the page, about the time it takes to tweet something. I started at 6:57 a. m. and had this up by 6:58. I wander away from it for a bit. I go and get my coffee and make sure the kids are getting ready for school. When I come back I see this page and I think, you know what would make this page better? A link to the actual study. So I spend a couple more minutes and track down the actual paper and add it. 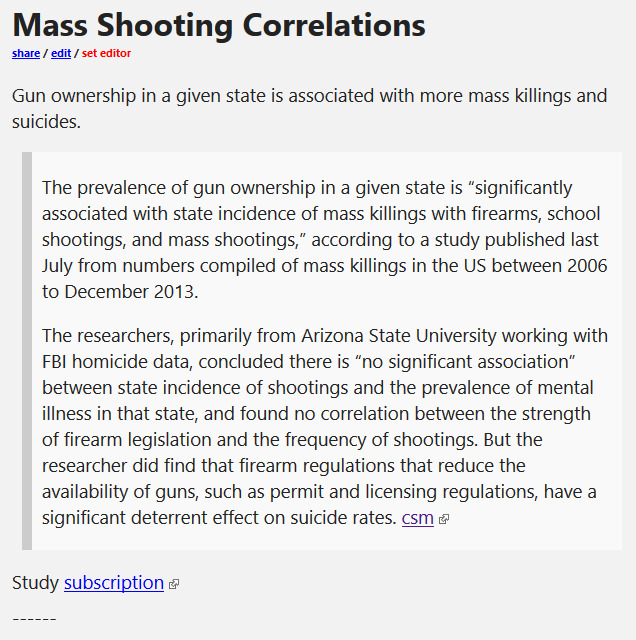 I add it, because this is the home page for this idea of mine on the web, and the home page for the idea should have a link to the study. Here we note we have a link to the study and indicate the link is only available via subscription. So far this is not terribly different than tweeting. But now I look for things to link it to. I search my wiki for articles on suicide I could link this to. And I get really excited, because I remember the Suicide Belt article I wrote six months ago, and realize that would be a perfect link. So I link to it and read it again. And what I’m trying to do now is think about what sentence I put in front of the link. I’m thinking about how I define the relation. However, reading it I realize it’s not the clean sort of support I was thinking about. Why? 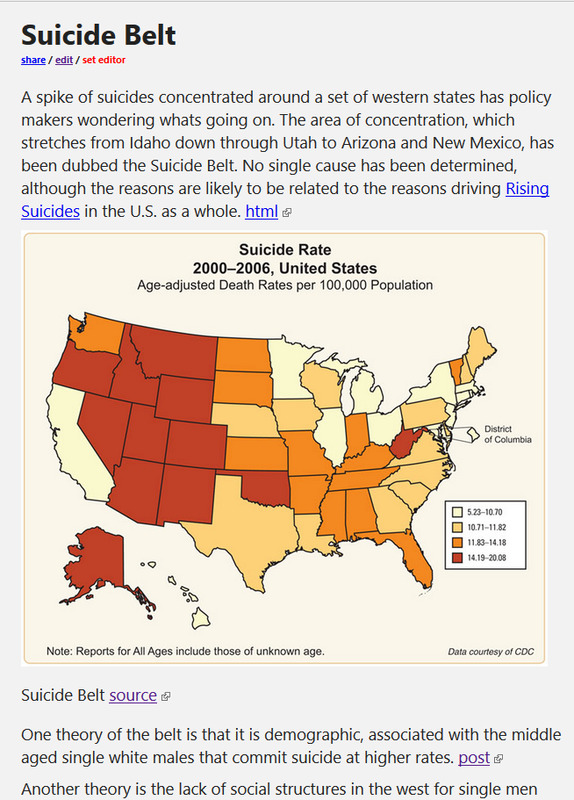 Because when I link to it it reminds me that many sociologists believe the suicide belt is a result of the white, middle-aged demographics of the American West. Suicide rates of whites are more than twice those of blacks and the recent rise in suicide rates is a purely a white phenomenon. 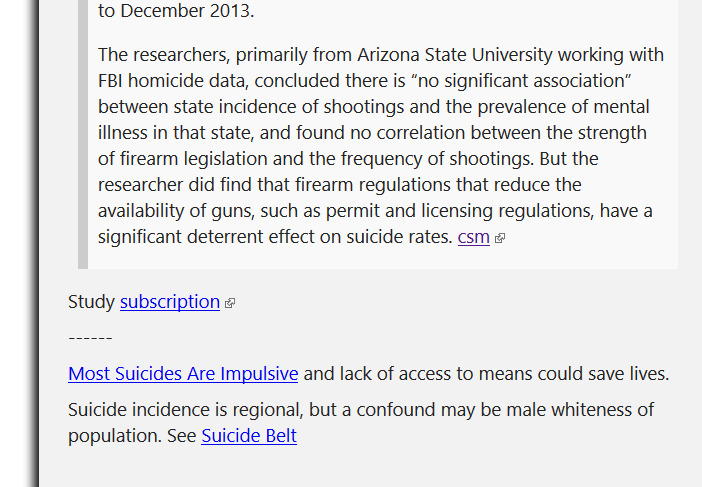 This punctures my simple story where more guns = more suicides because the truth is that western states full of white males are going to tend to have both more gun ownership and more suicide. I say that there’s a regional issue, but a potential lurking variable is male whiteness of population. Note how different this sort of meaning making is from what we generally see on today’s web. The excitement here is in building complexity, not reducing it. More importantly note how meaning changes here. We probably know what the tweet would have “meant”, and what a blog post would have “meant”, but meaning here is something different. Instead of building an argument about the issue this attempts to build a model of the issue that can generate new understandings. I’ve been working with Ward Cunningham, the guy who invented the original wiki back in 1995, on the educational use of this new personal wiki technology for a year and a half now, and I’ve been keeping this personal wiki, which is a collection of both my own stuff and stuff I’ve copied from other websites for over a year now. I have close to 1,000 articles in my personal wiki at this point. I have maybe 1,000 more scattered on other sites. They are from myself and others, most simple summaries of ideas I encounter, or data, or examples of ideas. Some are the result of afternoon-long rainy Saturday coffee shop investigations, but most are like what I have just showed you here, simple knowledge that builds complexity through linking. And when you get to that point, where you’ve mapped out 1000s of articles of your own knowledge you start to see impacts on your thought that are very hard to describe. Over time these things you write up start to form a deep network that helps you think. Here’s a representation of links to and from a page called “On Its Side” in my own wiki that details how Kandinsky invented his version of abstract art after seeing a representational painting of his on its side and not recognizing it as representational (and finding it vastly improved). You can see this is tied via associative links to and from it to computer generated poetry of the 1980s, a “found haiku” called Haiku by a Robot (“710,711,712”), an incident on the Twin Peaks set that led to the creation of the Killer Bob character, and Stravinsky’s attraction to the player piano. Other trails branch off into the relation between early abstract art and the Theosophical Movement. Together these things have meaning far more subtle and rich than one could get from a post or paper, a knowledge keeps its fluidity and continues to generate new insights. And weirdly, these links were compiled over the space of a year, just by noting things I learned or heard and linking them to things I’d heard before or that others had written. I created a wiki on issues of found art without even knowing it. This is my attempt to abstract from this experience something more general about the way in which we collaborate on the web, and the way in which it is currently very badly out of balance.. I am going to make the argument that the predominant form of the social web — that amalgam of blogging, Twitter, Facebook, forums, Reddit, Instagram — is an impoverished model for learning and research and that our survival as a species depends on us getting past the sweet, salty fat of “the web as conversation” and on to something more timeless, integrative, iterative, something less personal and less self-assertive, something more solitary yet more connected. I don’t expect to convince many of you, but I’ll take what I can get. To talk about this effectively I’d like to introduce two terms representing different approaches to the Web: The Garden and the Stream. Each of these terms has a history that predates me, but we’re going to tweak the definitions for our own purposes. 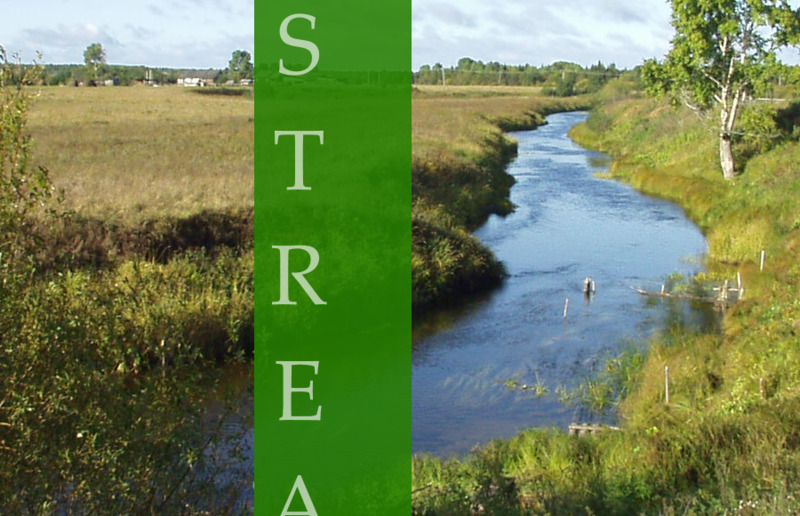 The stream is what I do on Twitter and blogging platforms. I take a fact and project it out as another brick in an argument or narrative or persona that I build over time, and recapitulate instead of iterate. I’m going to assume most people in the room here have read Vannevar Bush’s 1945 essay As We May Think. If you haven’t read it yet, you need to. If you haven’t read it I also kind of envy you. Reading that article for the first time was one of the great experiences of my life, and I think even today, after the web has made exposure to hypertext common it is still an amazing experience. Each memex library contains your original materials and the materials of others. There’s no read-only version of the memex, because that would be silly. Anything you read you can link and annotate. Not reply to, mind you. Change. This will be important later. More than that, there’s a substance to the vision that you can’t help but long for reading it. Note that connections here aren’t banter, but the construction of a mental model of a subject area. And that model can be taken by someone else and extended, built on. Humanity can advance, not through argument by through a true collaboration. It really is the ultimate garden. So when we look at the web today, we see very little of this original vision. What happened? Originally I had a long narrative in this section, and the story moved between the WELL and Howard Rheingold and Dave Winer and mailing lists, and Jorn Barger’s epic goodbye to the Kate Bush news group. Maybe we can have an outtakes section that captures that? Maybe beers tonight is the outtakes section. Maybe whether you like it or not. But I’ll boil it down to this. It came down to who had the power to change things. It came down to the right to make copies. But what a server-centric web is really good at is distributed conversation. A bunch of people frustrated with Usenet and mailing lists and BBS culture realized this, and they created something that was half-hypertext, half forum. And it was called blogging and it was beautiful, and it turned out to be the prototypical Stream. And when they added syndication to that model it became amazing. So in 2006 or so Twitter, Facebook and other sites move to a model directly inspired by this personal page + feed reader combination. You have a page which represents you, in a reverse chronological stream — your Facebook page or Twitter home page.The pages of people you are friends with get aggregated into a serialized time ordered feed. Your Stream becomes your context and your interface. So what’s the big picture here? 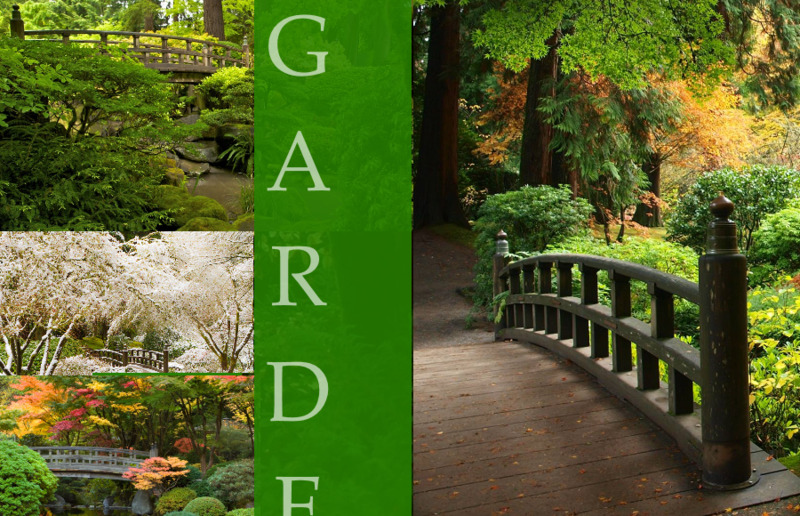 Why am I so obsessed with the integrative garden over the personal and self-assertive stream? Blogs killed hypertext — but who cares, Mike? This brings us to learning design. Dave Cormier had an interesting post a month or so ago about how “every we makes a them”. You get a large class together and it fragments, partially to protect itself from scale. Cliques develop. The cool kids table emerges. Others complain they are not being attended to, the cool kids say well sorry but we know each other and we want to sit next to one another. It’s interesting to me that we so assume that online interaction is about conversation via blogging, tweeting, commenting — and ONLY about conversation that we assume this is the way things must be. But where are the cool kids in the Memex? In the Va-NEE-var Bush scenario? I’m sure they are there — someone gets linked more than someone else, maybe unfairly. We know this sort of thing happens. But compared to blogging, which is so personality and conversation driven, I can’t help but feel that we’d be looking at a massive improvement in bridging social boundaries. Kate Bowles, who graced us with her presence in both the fedwiki happenings, had a metaphor she liked for the learning environment of what we are calling gardeners here. She talked about Studio Space, the idea of working next to people while building, of looking at their stuff out of the corner of your eye. Your *work* reacts and connects to theirs, not in this disposable or reactive way, but in this iterative way. And it’s about getting back to the idea that our Personal Learning Network isn’t just our twitter followers, but is an effort to connect work together not just people. And maybe to understand the process of connecting and building and extending the work of others is as human and engaging as the conversational Stream. But what federated wiki is the Dynabook. It’s the crazy stuff you’d see if you had walked into Xerox PARC in 1977. You’ll see some of its solutions in tools in 10 years. Documents that choose proliferation over centralization. Page and paragraph level-forking. Edit and fork trails that travel with the document. Link resolution contexts that build off those trails. Page items as JSON, with serial numbers that can be tracked across a new sort of web. Page names that form semantic networks in interesting name collisions. But I’m here to tell you if you are a tool builder you need to start thinking how to build this into your own tools. There are ways we can hack this. You look at the pages, and you pull the good ones (Environmental Concerns and Local Subsidies) into your garden. You rewrite some of the bad ones. These ping out from the notifier, and suddenly you can browse for OER across thousands of disconnected sites the way we saw earlier with the Kandinsky example. Imagine that — you plug in one term from your syllabus, and you’re plugged into a rich array of content. It’s almost like hypertext, right? If you understand what the distributed, overlapping garden looks like you can do this to your own tools. You could build these sort of systems in WordPress, Pinboard, Scalar, whatever. You could make your portfolio system more like this, your LO repository more like this. I could go into other examples — really, i could go on. But I think it might be more productive and efficient to let you all see if the metaphor helps conceptualize your own challenges in helpful ways. We have a couple days to talk about this. And so we come to the question of whether we are at a turning point. Do we see a rebirth of garden technologies in the present day? That’s always a tough call, asking an activist like me to provide a forecast of the future. But let me respond while trying not to slip into wishful analysis. And from my own perspective, the project I’m working on with Ward Cunningham, federated wiki, made zero sense to people even two years ago, but I can feel a sea change now when I describe it. I’m still starting the ball from the back of the field, but at least I’m on the field. I’ll take it. And finally, here we are today. My sense is that this conference is an attempt to think bigger than the next app, the next press release, the next buzzword; that what we want to do here is to seriously interrogate the assumptions that are hidden in plain sight. The fact we’re doing this, here and now — to me that’s a sign as well. And it’s promising. There’s so much I had to cut out of this talk, about cross-institutional collaboration, about the stream and exclusion, the Garden and integrative education. I hope you’ll ask me about some of those, either in a couple minutes here or over the next few days. But I’ll leave you with this: we can imagine a world, I think, so much better than this one, if only we can get our heads out of the Stream for a bit, and build the Garden we need. So let’s talk about how to do that. What’s more, these frustrate one of the crucial features of wiki practice: they don’t let you link to pages that don’t exist yet. Recently I found a way to abuse Tumblr tagging to get wiki-like linking in Tumblr. It’s not quite wiki, but it’s worth exploring as a productive abuse of Tumblr and as an experiment on thinking about the coming merge of blog and wiki. Details in video below.